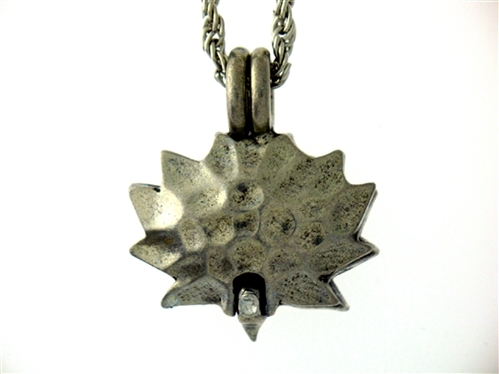 Our New Lead Free Pewter Aromatherapy Essential Oil Diffuser is an amazing 3 dimensional Lotus Flower. This beautiful piece of wearable art has been in the mind of the designer for several years and when the design hit the drawing board, it was breath taking! Each petal of the Lotus flower is curved, just as it is in nature. The lotus flower is one of the most ancient and deepest symbols of our planet. The lotus flower grows in muddy water and rises above the surface to bloom with remarkable beauty. ... Untouched by the impurity, lotus symbolizes the purity of heart and mind. 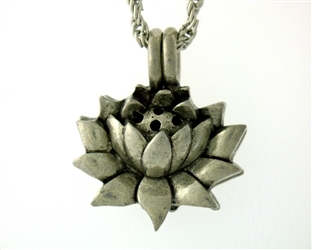 The lotus flower represents long life, health, honor and good luck. This diffuser is 1-3/8" long and 7/8" wide. An intricately carved 3 dimensional Lotus Flower in bloom decorates this diffuser.